Young people on the course developed their own film ideas, learnt how to use a camera and sound and were introduced to editing. They produced four films: a trailer, an animation, a drama and a documentary. 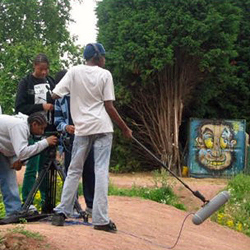 The course was led by young film makers from Peckham Youth and Animation Media (YAM) and supported by two volunteers. The films were screened at the Ritzy Cinema in December 2007. Participants invited their family and friends to showcase their work and receive their certificates. Two of the course students went on to make a film about the Lambeth Football Tournament. Time Bell – a trailer about the planet. Bang Bullet Bang – an animation about gun crime in Brixton. Green Eyes – a sci-fi drama about eternal youth. To develop team working skills. To give young people a chance to express themselves about issues that concern or interest them. To provide digital film making training, including camera work. A DVD of all the short films is available upon request.